I'm sharing another Christmas card today featuring the oh so gorgeous Pion Design Christmas collection 'GREETINGS FROM THE NORTH POLE'. 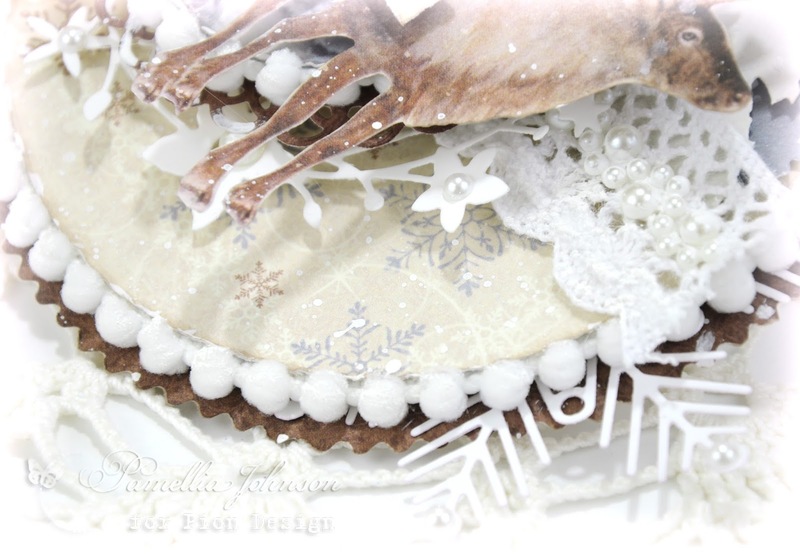 I just love the soft winter scenes and snowflake designs of this collection and I'm sure you will too! For the ornament shaped base, I used Spellbinders Grand Circles as a template and hand drew the cap portion. I made a set out of a leftover pizza box so I can easily use this design again in the future. The snowflakes are Cheery Lynn, The brown die is Spellbinders Lacey Circles, the Poinsettia and the Treeline die cuts are Sizzix, the wreath is Memory Box and everything else is from my stash. There were a couple of areas that really confused me. A huge set of stairs down, and then just a few yards ahead, a huge set of stairs back up. OK folks, this is a 'conservation' area... try conserving some of those natural resources and just make a little bridge straight across! Fools! One last root infested hill to walk down and we were finally at our destination... the river! YAY!!. Of course, you know, I'm gonna make you wait until Tuesday to see those photos. Aren't you just on the edge of your seat with anticipation! Bwahaha!! And back on the home front, the kissy kissy couple of Starlings are back. This time up on the roof and squawking like it's going out of style! I'm wondering now if the female is just a young one? PATRICIA says hello from the tree, where she is trying to cool off from our 105 degree weather today. Poor girl, there's not much shade in the tree since the drought caused anorexic foliage growth. LOOK!! A new baby squirrel!! I can't believe that there are still new babies at this time of year! I love baby squirrels, but I worry that there's not enough time now for them to grow up before the snow starts falling. Last but not least, my token morning coffee shot. This one is a little different, it wasn't the oranges and yellows that caught my attention, it was the fact that these clouds were so blue that they looked fake! Awesome! I'm just back from holiday so popping in to see what I've missed and your lovely creation in and photos in this post are a great starting place. A wonderful idea to make a Christmas ornament in your own unique style. Ooooooh, your fantastic Christmas ornament card is a pure joy, Pamellia! You really know how to use those awesome papers in a perfect way! That fabulous white Poinsettia along with your perfect bow is a cherry on top! I adore your spectacular design of this unique and special card! Another fantastic set of photos from a real pro! Love, love, LOVE! What a stunning card! I love the colours and the design is amazing! Love the stag and the trees in the background ... everything is just breathtaking! Wonderful photos! Plenty to link up at OBW this week! That is some hike! This bauble card is delightfully festive and frosty. Love all the fussy cutting of the reindeer and layers of trees. 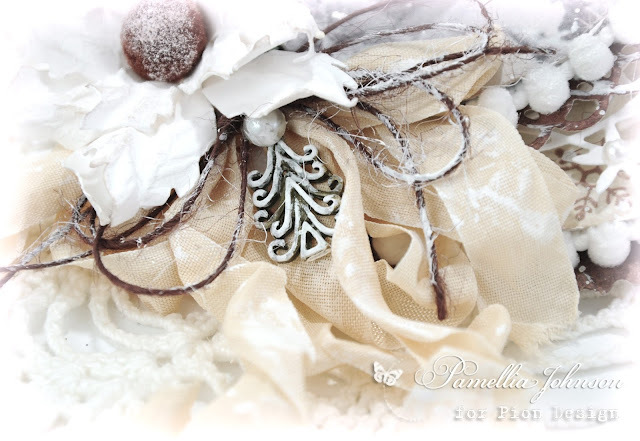 Oh my goodness, Pamellia, this is one of the most beautiful Christmas cards I've seen!! The ornament shape is fabulous and so creative!! The layers are amazing!! It's just so wintery and magical!! I love the trees and the pearl stems...I love every single thing about this!! It's spectacular!! Wow!! Your cards are such a delight! Love the beautiful scene you created. Fabulous photos, as always. I didn't know it got that hot in Canada! Here I am always wishing I lived further north for colder weather! Stunning card, love the shape...this will be displayed year after year as a hanging ornament. 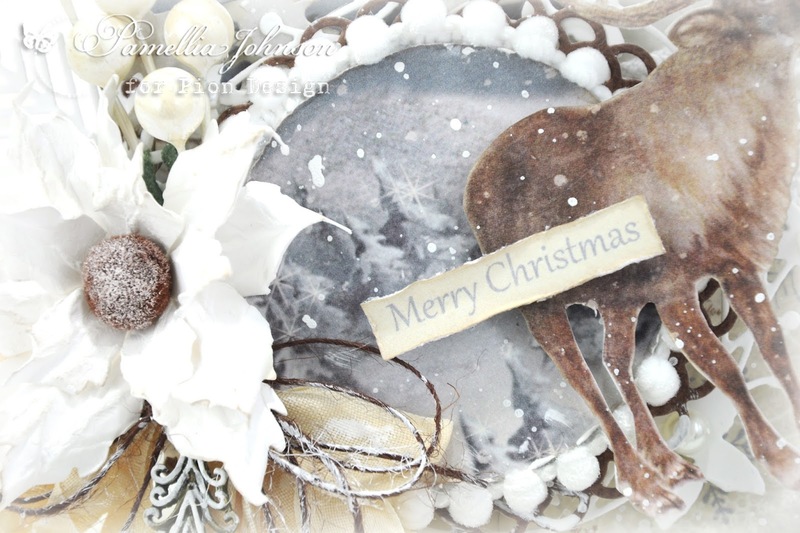 Beautiful layers and colours, fabulous reindeer. Love the 'snowball' trim, adds to the soft and peaceful look of this lovely creation! Just imagining Junior's reaction if you poked him to see if he's still breathing!!! Probably best to stick to the peanuts! 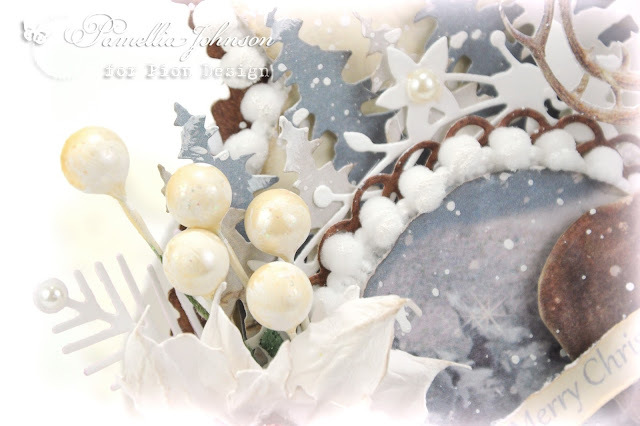 Absolutely amazing creations Pamellia, you use the most gorgeous embellishments, what a beautiful image and design, I love your pictures and your babies, how cute is the little baby, I saw some baby red squirrels here a couple of weeks ago when I was driving out the village, so tiny. 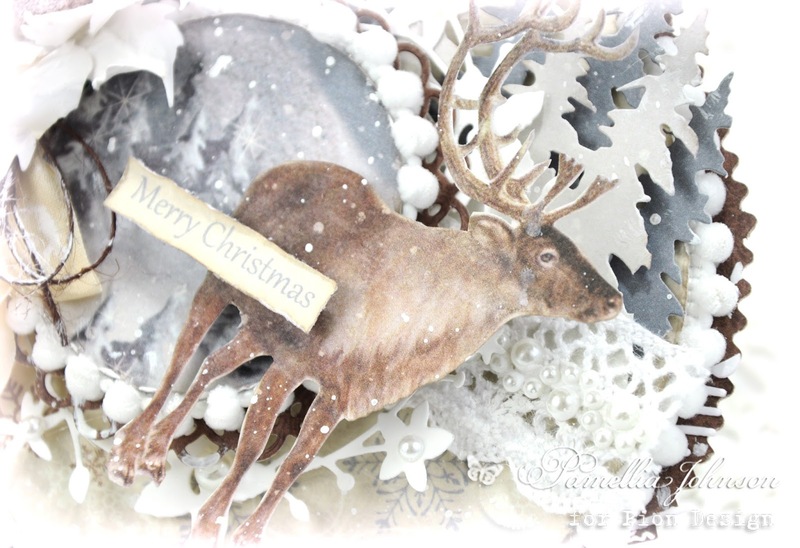 Wow I loved the ornament shape a lot and always fabulously layered ,beautiful vintage Christmas card ! Love that you used a leftover pizza box for template, I always found them very useful before their strong cardstock :D Surely you used this shape again, it's wonderful! 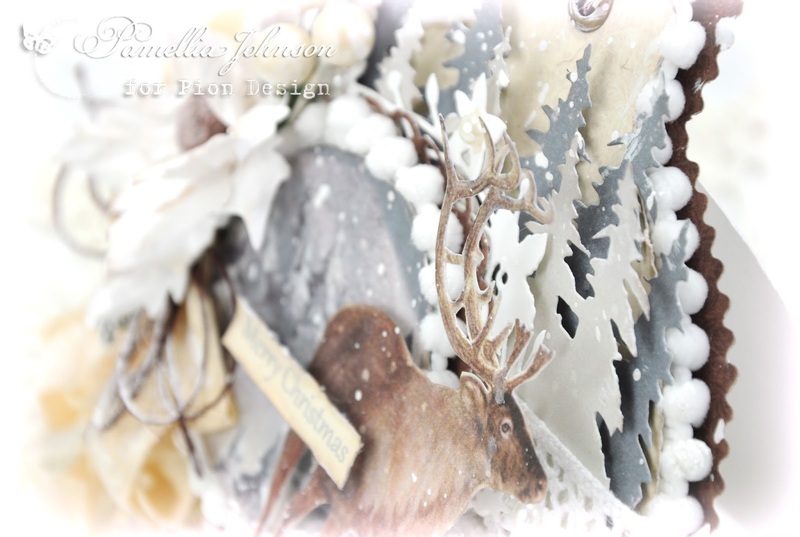 The papers you used are really perfect for this project, and LOVE the reindeer and the treeline! Amazing shapes and embellishments, that ribbon with the soft balls around the circle looks just fabulous, as well the poinsettia! Wonderful layers and textures! 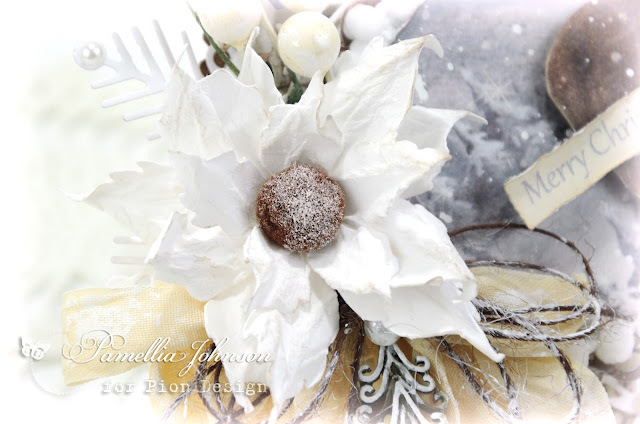 Beautiful Holiday card Pamellia! Love all the pretty layers and those Pion papers are really gorgeous! Holy smokes girl, what a GORGEOUS Christmas card Pamellia! It is packed with so many fabulous details and such a great shape! The papers are so pretty and I love the cluster of tree's..so many fantastic elements again! 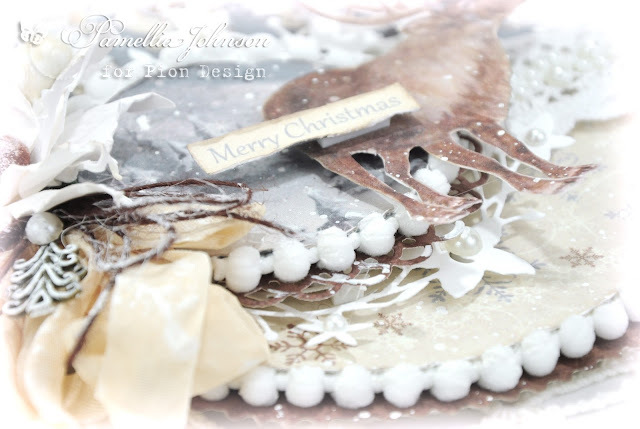 I don't know where you find the time to create such wonderful cards each week...so beautiful and so inspiring Pamellia! Thanks for sharing all these beautiful, gorgeous pictures from Belfountain Mountain. What a spectacular place to visit!!! I hope you have are having a wonderful wknd! Hi Pamellia, stunning Christmas card, all those layers are gorgeous and what beautiful detail and embellishments. Outstanding Christmas card Pamellia..just beautiful and love the reindeer and pom pom trims..gorgeous..I have a grandson who used to sleep with his eyes open..quite a bit..but I was able to poke him..lol..fabulous photos..
A stunning card Pamellia, gorgeous, gorgeous images and layers. Thank you for the answer about the walk and the photos, today's pictures are all super as well. Your card really does conjure up thoughts of what the north pole might look like - breathtaking and incredibly frosty - I love the pom poms around the circles and the poinsettia is gorgeous! Love your circle creation Pamellia, (great minds lol) your layers and embellishments are stunning, as is the beautiful colours. Those steps sure look dodgy, think i might have thought twice about attempting them!. fabulous photos of your adventure, and of course your animals. Oh boy, oh boy. Your Christmas card is so romantic and dreamy and I love the bauble design, how clever of you. It seems so odd looking at all of that snow whilst sitting in this heat - now I know how the girls in Australia feel when they are making their Christmas cards. 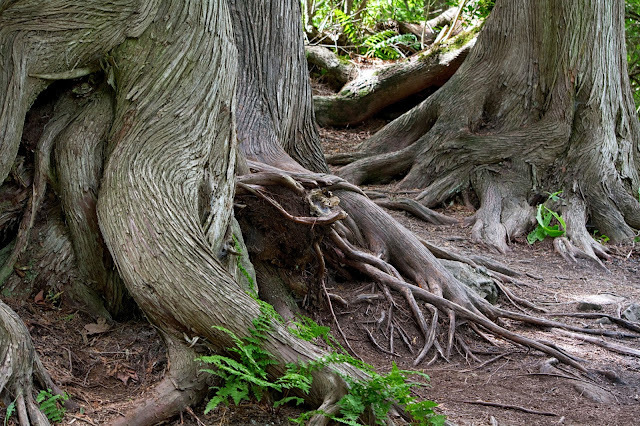 Fabulous photos of your hike around Belfountain Mountain, I assume that it has suffered a lot of serious soil erosion to expose those tree roots like that. It looks like it was quite an energetic hike, I do not know whether you get your energy from. Ohhhhh Joy! This is my new fave Christmas design of yours dearie! This is Rustic Glam at its best! I don't even have a word for it. Love everything about this and the use of the pizza box and having a template to use=genius! Drooling over here! Seriously jaw dropped, open mouthed. Whew! This is just amazing. Love all your photos and cards. Hmmm - I commented and it disappeared - hope this one does not do likewise. Your ornament is fabulous Pamellia - need I say more!! You must have been exhausted after your escape from the mountain!! Those are serious stairways. Love your squirrel photos - they are quite characters, especially Junior! Love, love, love this ornament, that deer seems to come right out of the bakcground giving such a great 3D effect, stunning!! Great photos too of course! Ooooh! I'm loving this ornament, Pamellia! What a beautiful little scene you have created and I love the blues and browns! I could sit and stare at this all day! 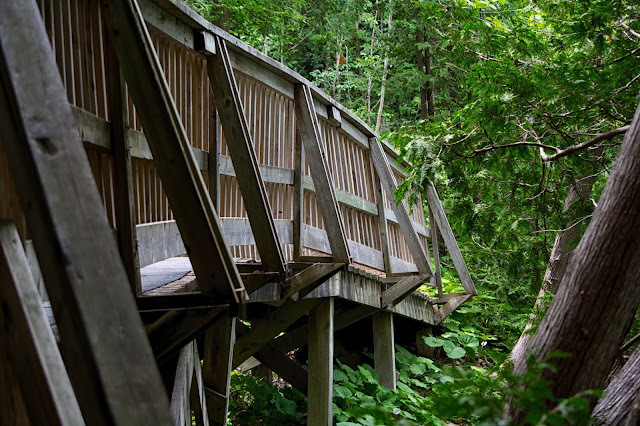 Your Belfountain shots are amazing; love those tree roots in the photos, but I bet they were a bugger to navigate! Your birdies are feeding the young 'un--it's a sweet sight to see. Ok, with the baby squirrels--now I'm having dreams about baby squirrels--REALLY! Now I will probably dream about animals sleeping with their eyes open--yes, it's creepy to me, too! Big hugs to you! What a STUNNING shaped card, the details as always are so perfect, it shouts Christmas. Love it and the colours. Fab piccies again, did you notice in #6 close of the roots, there is a gnome face there? OR is it me LOL. Gorgeous creation Pammelia and great pictures. I do love their products, but LOVE what you create with them even more Pamellia!! A fantastic project to admire!!! WOW!!! And your photos are wowsers --always and ever! I love them always so much! wishing you a happy newe week! 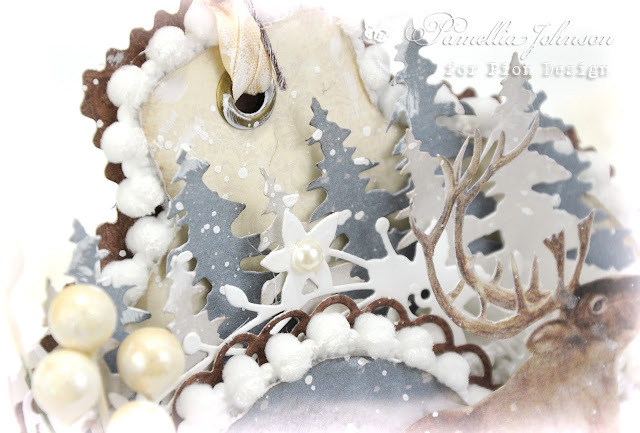 Stunning ornament Pamellia! I love the way you put it together. A great collection of products :) All those tree roots are creepy looking lol! I see jr is up to his ususal! Such a pretty Christmas masterpiece with all those tiny pompoms and fabric embellishments! Gorgeous! Thank you for sharing yet another fantastic piece of your heart! 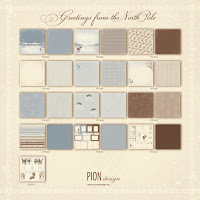 Just saw this stunning winter card over at Pion - simply beautiful. And I love the mountain adventures as well as the squirrel updates! Magnificent festive creation. The reindeer looks almost 3D. My goodness, that's a lot of steps to negotiate. You both must be fit as mountain goats lol! Gorgeous! One of my favorites!